Today my library staff decided to play a big April Fools' joke on our custodian, AAB Ritchie. Ritchie is generally a good sport about these sorts of things. We pick on him all the time, and sometimes even to his face. 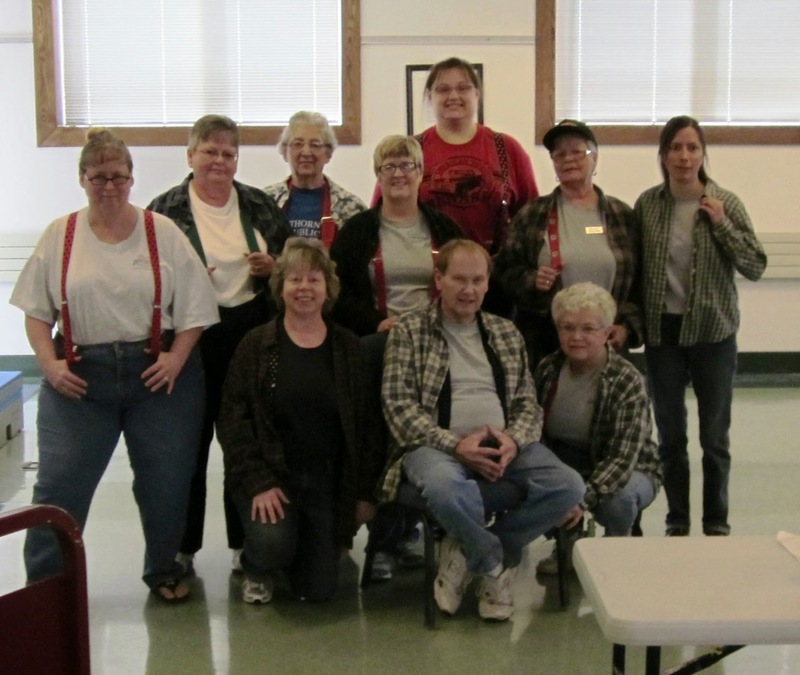 For April Fools' Day, the staff decided to dress up just like Ritchie. Ritchie's work uniform consists of jeans pants, tennis shoes, a tee shirt (usually gray, and either Menard's or Evergreen Indiana), and a flannel or some sort of overshirt. OH--and suspenders. So today we had 11 AAB Ritchies running around the library. It was insane. Right now we have the cleanest toilets in Indiana. So overwhelmed he had to sit down. Now, there are a few people missing from this photo: AAB Myrtle, who's off vacationing and is probably Not At All Sad that she missed the photo; AAB Alec, who was not scheduled to work and is probably relieved that his missed the photo; and AAB Phyllis, who was actually off WORKING and giving a tour of the museum while the rest of the staff was goofing off being photographed in the library meeting rooms. Of course, there's one other notable omission. ME. Which was fine by me, since I do not wear jeans pants, tennis shoes, tee shirts, flannel shirts, or suspenders. Anyhoo, AAB Phyllis didn't get a picture with the staff, and didn't even get a picture with AAB Ritchie, who was so overcome by all of the excitement that he had to leave early to go to Menard's and purchase cleaning supplies with a rebate coupon. I offered to be in a picture with Phyllis, seeing as how AAB Ritchie and I are both redheads. At least they didn't try jeans pants. Please notice the lovely and smiling AAB Phyllis restraining holding the very grumpy and UNsmiling Tober. Also notice the paper suspenders taped to me. This is worse than a collar! Joke's on me, I guess! Tober, you're a good sport to wear paper suspenders and pose for pictures. I don't wear a collar either, I removed all three of my collars myself! My mom finally gave up. Good joke on AAB Ritchie. But making you wear suspenders? Aren't you a bit underdressed to need them? Just wondering.